Believe it or not, there were some truly great 90s comic book movies. For many of us, that particular decade doesn't feel like it was all that long ago, but it is a time that is getting further and further away in the rearview mirror. There is a lot of nostalgia for things made during that period be it toys, games, music and yes, movies. The thing is, not everything holds up as well as we would like it to and the 90s specifically had not yet cracked the code on comic book movies. Long before Marvel would launch the Marvel Cinematic Universe and lay out a template that virtually every studio in Hollywood is trying to emulate, comic book movies were just something that studios would try. In the 90s it was a completely, seemingly random thing. Sure, some movies were made based on books from the big two, DC Comics and Marvel Comics, but really it was all over the place. It wasn't the cornerstone of the industry like it is now. Things really started to change in 2000 when Bryan Singer's first X-Men movie hit theaters and the era of the modern comic book movie as we know it truly launched when Spider-Man came out two years later. 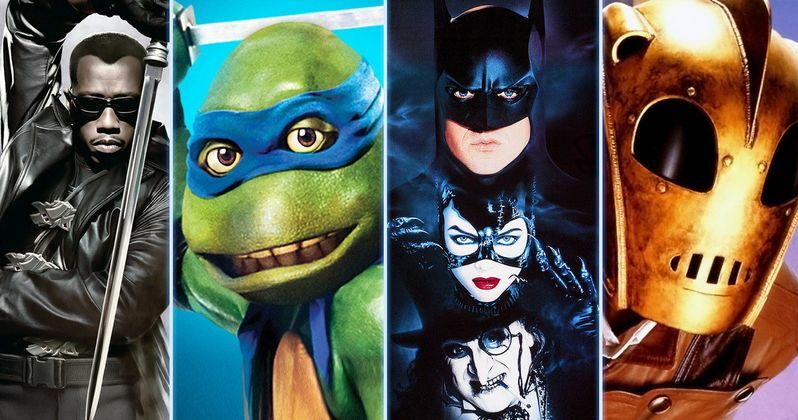 These are movies that felt like they borrowed some of the best elements of things that were done in the 90s and they learned from the mistakes of some of the worst movies that were made in that decade that were based on comic books. And there were plenty of those to go around. Movies like Sylvester Stallone's Judge Dredd or the famously terrible Tank Girl (which now has something of a cult following) took material that has proved it can work today under the right conditions and really bastardized it, simply because it seemed like the system had no idea what to do with it. Not to mention what Marvel movies looked like in the 90s. There was the unbelievably bad Nick Fury: Agent of Shield that starred David Hasselhoff as Nick Fury and the truly terrible Captain America movie from 1990. The point is, a lot of mistakes were made and there was a lot to learn from. With that said, there were a lot of positives that happened as well, which are things that helped pave the way for the comic book movie period we are in right now. Some of the best comic book movies from the 90s are movies that you wouldn't even think of as comic book movies, while others were astounding anomalies that just managed to do superheroes right at a time when that wasn't very common. So here are the nine best comic book movies of the 90s. For some reason, Hollywood has had a relatively tough time truly cracking the code when it comes to the Teenage Mutant Ninja Turtles. The most recent Michael Bay produced reboot succeeded in some areas, but failed big time in others. Outside of the comic books, the first live-action Teenage Mutant Ninja Turtles movie from 1990 may still be the best representation of the heroes in a half shell to date. Sure, it is incredibly corny, cheesy and at moments maybe even groan-worthy when watching it as an adult, but the amount of joy 90s kids felt watching this movie can't be ignored. The movie also really helped propel the Ninja Turtles into the pop-culture consciousness. Seriously, so many toys came as a result of this movie. Critics may not love it, but fans of the Teenage Mutant Ninja Turtles probably have a soft spot for this movie. Not everything has to be gritty and overly serious. Sometimes you just need people in huge, weird Ninja Turtle costumes fighting ninjas in goofy suits to have a good time. If anyone is ever going to make a truly great live-action Teenage Mutant Ninja Turtles movie in the future, they would be smart to take some cues from Steve Barron's early 90s fan favorite.